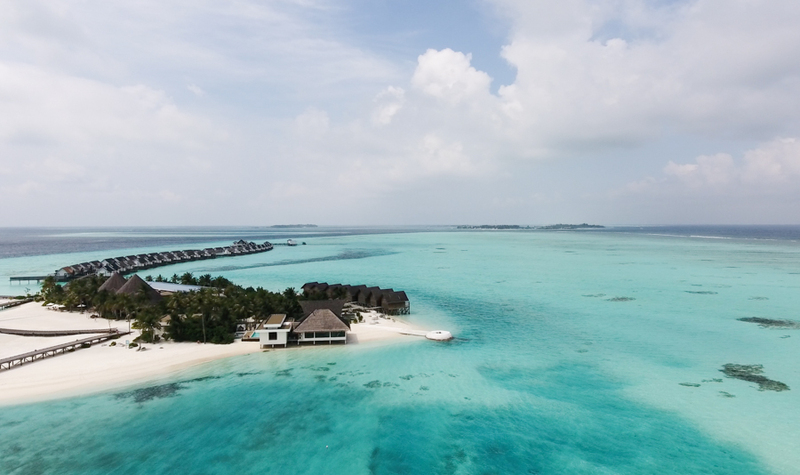 Every trip to the Maldives is an escape to paradise but when it comes to enjoying the enviable sandy white beaches and crystal clear waters it makes all the difference as to just how and where you decide to indulge! 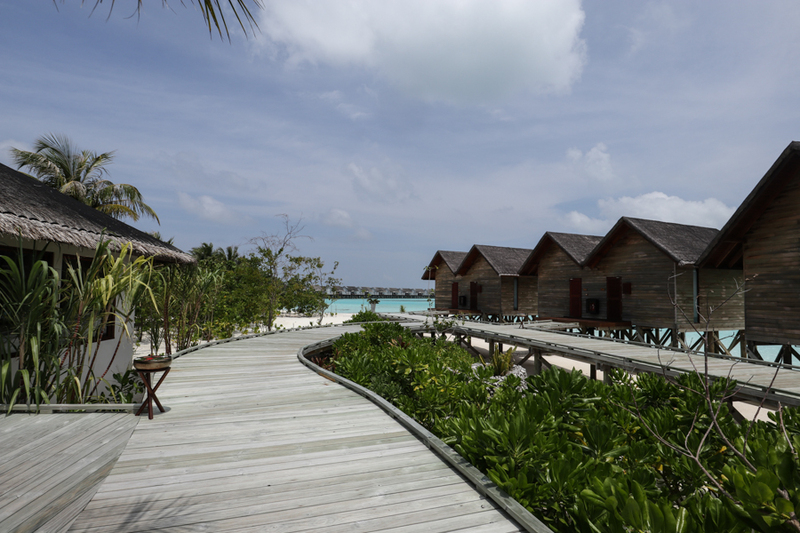 I recently spent a week at the luxury resort of OZEN By Atmosphere at Maadhoo Island. 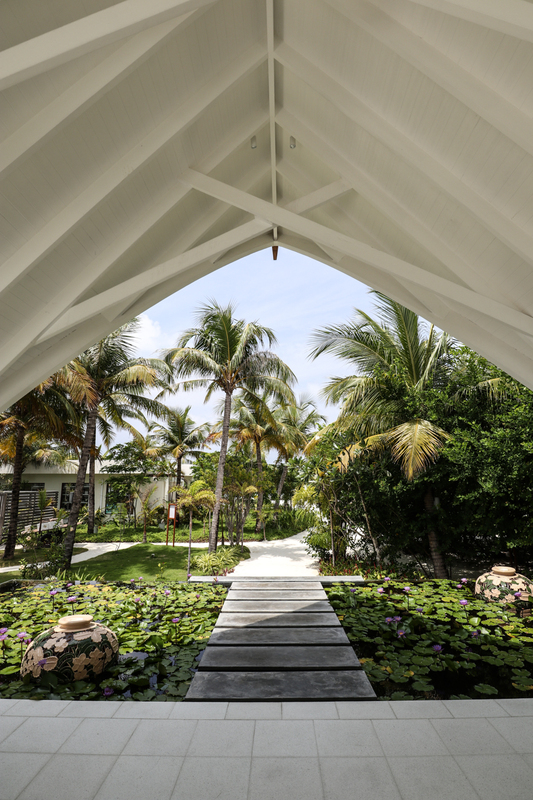 Ozen is the leading resort within the Atmosphere hotel group and it takes just a few petal lead steps onto the island to realise and appreciate why this is the case. 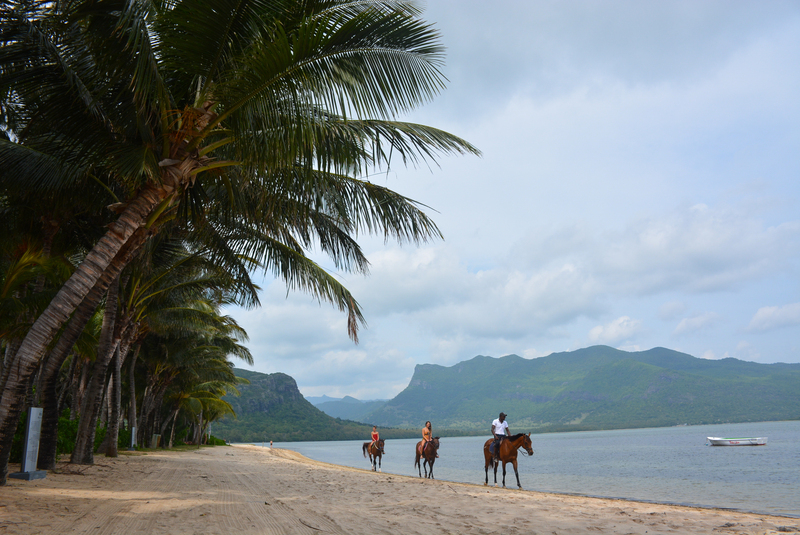 The island is accessible via speedboat transfer from the international airport and the process of arrival is as seamless as they come, a representative greeted us with a smile and took our luggage from our hands straight to the hotel’s plush boat where we were met with a fresh juice and cold towels. Within 20 minutes we were out at sea and on our way to the island. As the boat started to glide rather than roar we looked up out of the window and saw the breathtaking beauty of Ozen. 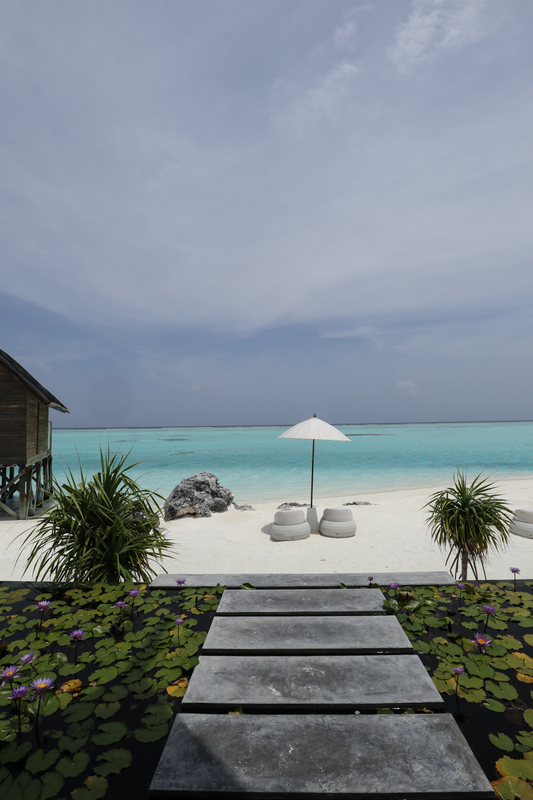 if heaven were a place on earth, the Maldives would be what comes to mind and seeing the islands we were about to live on for the next week was a true ‘pinch ourselves’ moment! 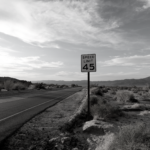 I travelled with my friend Aimee on this occasion and her squeals of delight confirmed my silence of awe, we had arrived in a dream land. 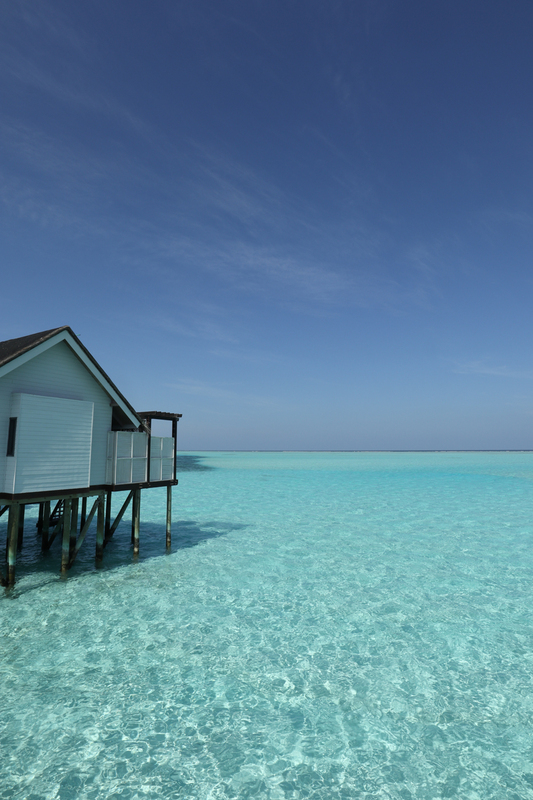 Nothing can really fully prepare you for the beauty of the Maldives, photographers, myself included, will do their best to showcase the tranquil transparency of the ocean or the buttery soft sand lined with vivacious palm trees but being there, truly immersing yourself it’s a priceless and indescribable feeling. 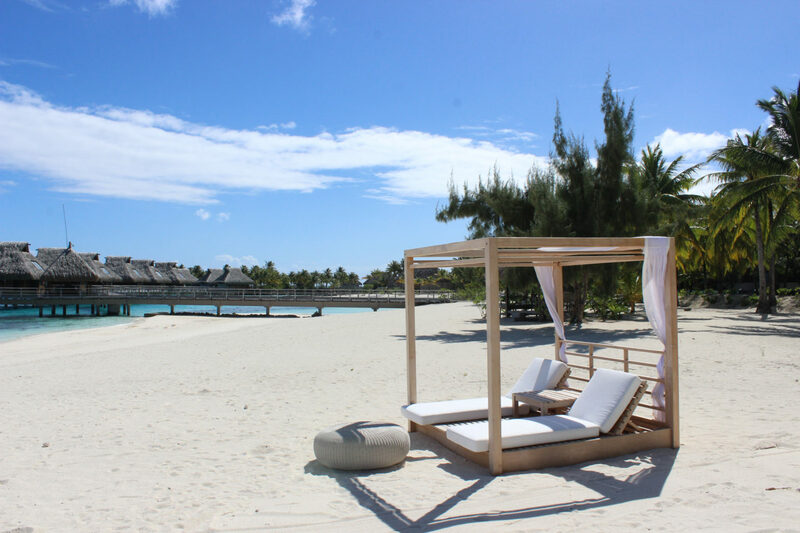 When you then factor in a five star service, it’s the kind of holidays that dreams are made of! 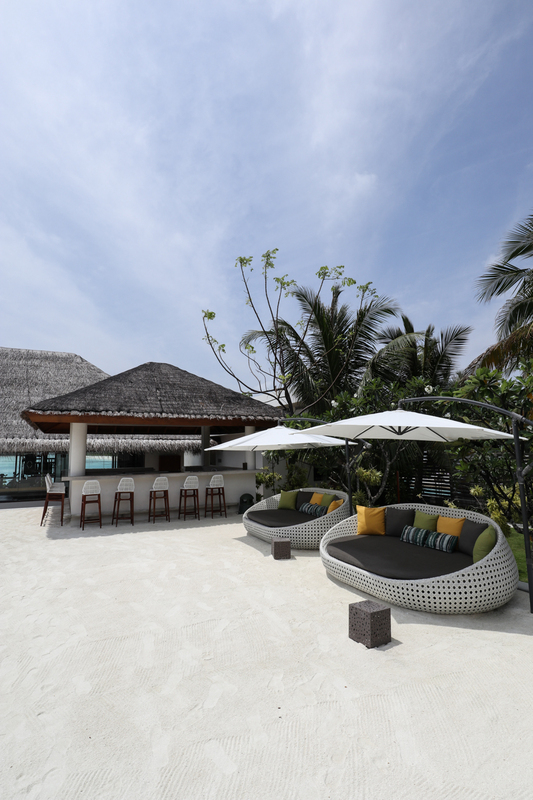 OZEN By Atmosphere at Maadhoo Island is a cut above the rest when it comes to luxury paradise stays, there never seemed to be so much as a pebble out of place and the warmth in the hearts of the staff members shone brighter than the sun itself. I would jump in here with the classic saying of ‘no request was too much trouble’ but in actual fact few requests were needed to be made as the team were completely on top of everything and the rooms and resort amenities catered for every wish before you had even made it! 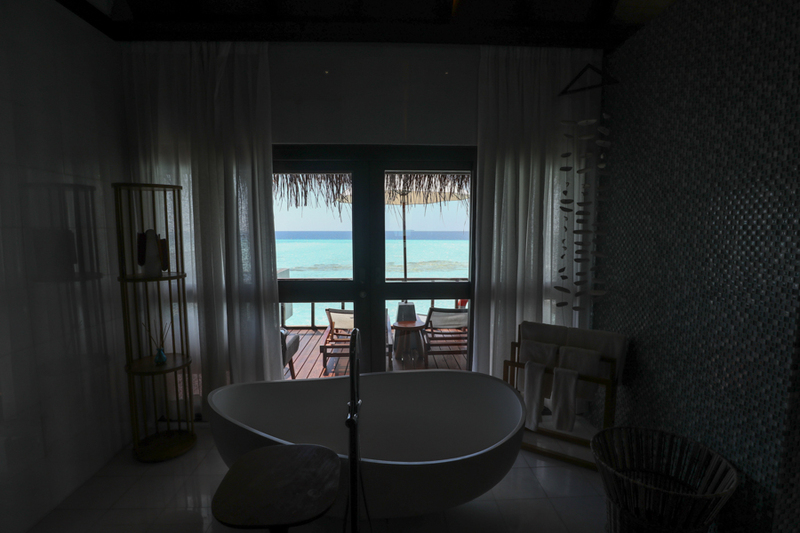 Out stay was split between two different accommodation types, we spent our first few nights in a water villa and the last few in a beach villa, providing me with a perfect perspective of the beauty of the hotel and the ability to talk you through both suite styles. Being truly spoiled, both rooms came complete with our own private swimming pool but other than this residing factor the two were very different, both gorgeous in but each offering their own unique and charming way to show off the stunning scenery. 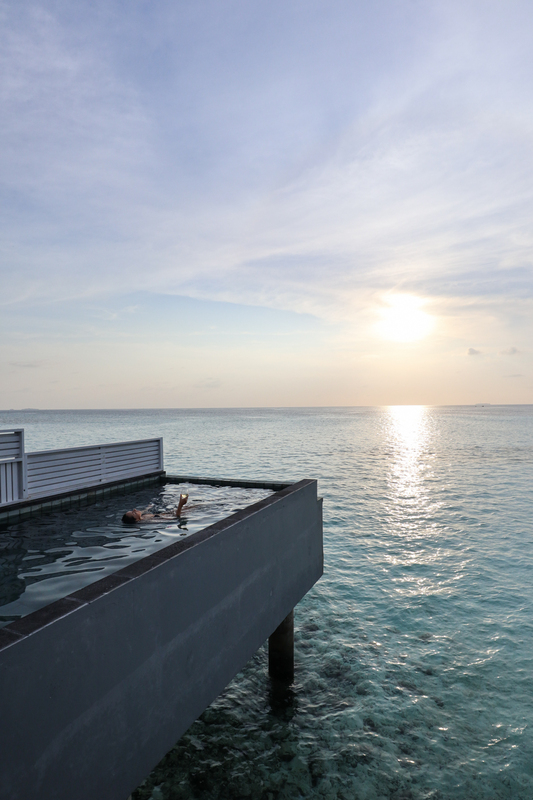 Our first few nights were spent in the water villa, one of the larger suites built on stilts within the ocean and with a huge swimming pool in the outdoor space enviably facing direction of the sunset. 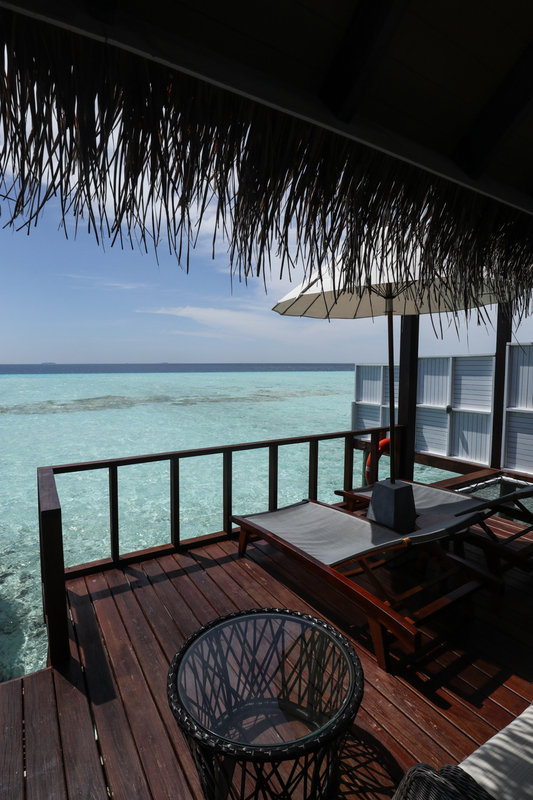 When you think of the Maldives you think of accommodation like this, open air living with a panoramic view of the sea from every single corner, bliss! 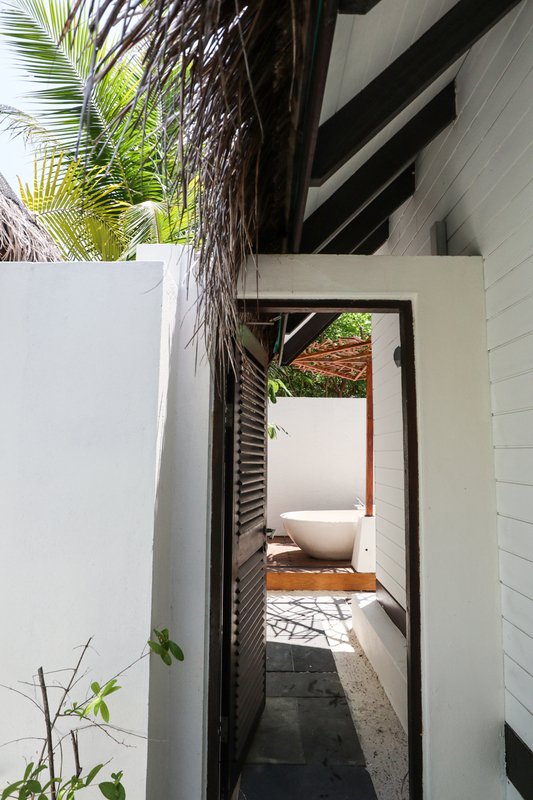 There’s a large open space bedroom complete with glass windows on the floor for an additional reminder of the structure being above water, a huge bath and dressing room and an outstanding outdoor space looking out to the vast expanse of ocean all around you. 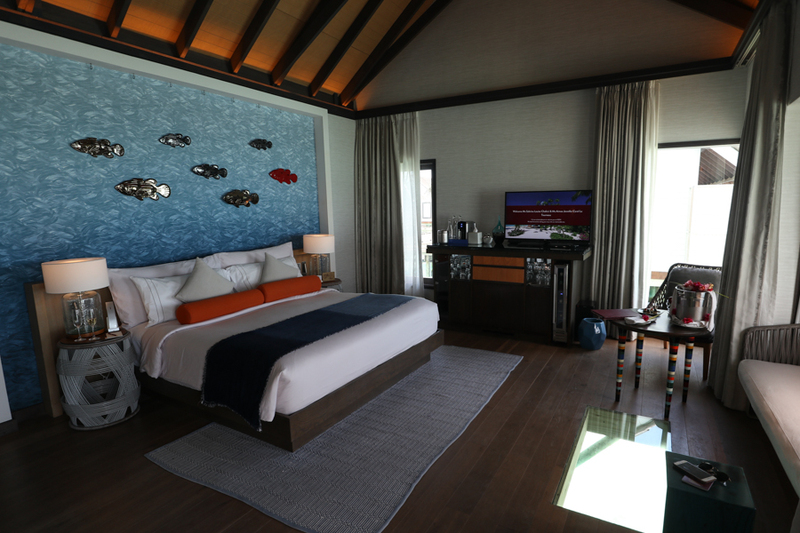 It was one of the largest water villas I’ve stayed in myself and the hotel’s well awarded five stars were showcased with the amazing amenities and top class butler service (complete with a mini foot massage during check in!). 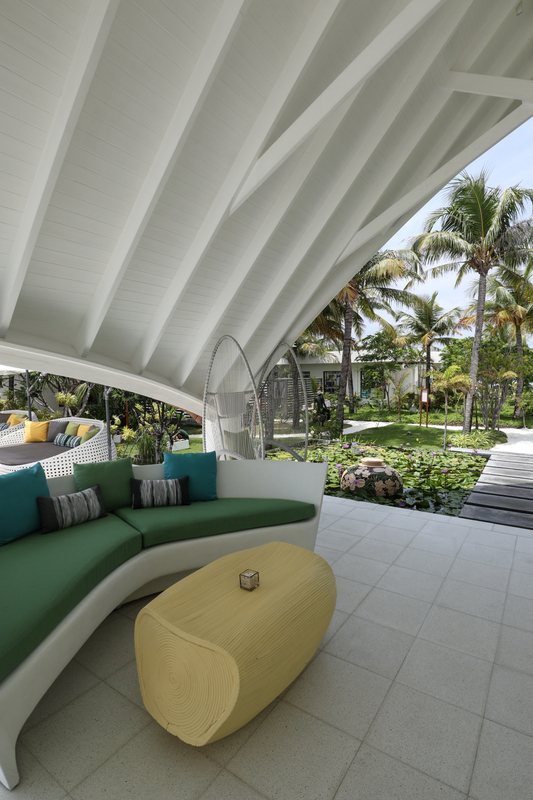 The lounging balcony had a dining area, sunbeds and a stretched hammock above the ocean as well as the show-stopping swimming pool leading out to infinity. Whilst the villa’s convenience made for quite the relaxing spot during the day the pure magic of this hotel was, in my opinion, watching the sunset over the horizon whilst swimming in that very pool. 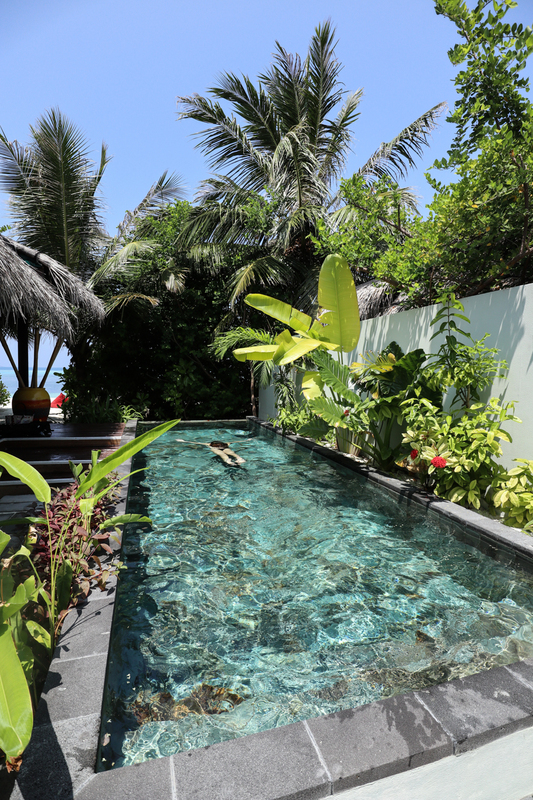 As many occasions of time spent in the Maldives have touched me before, our evenings drinking wine in our own little haven will be engraved in my memory forever, search ‘content’ in my open brain tabs and the picture painted will be the one you see below. 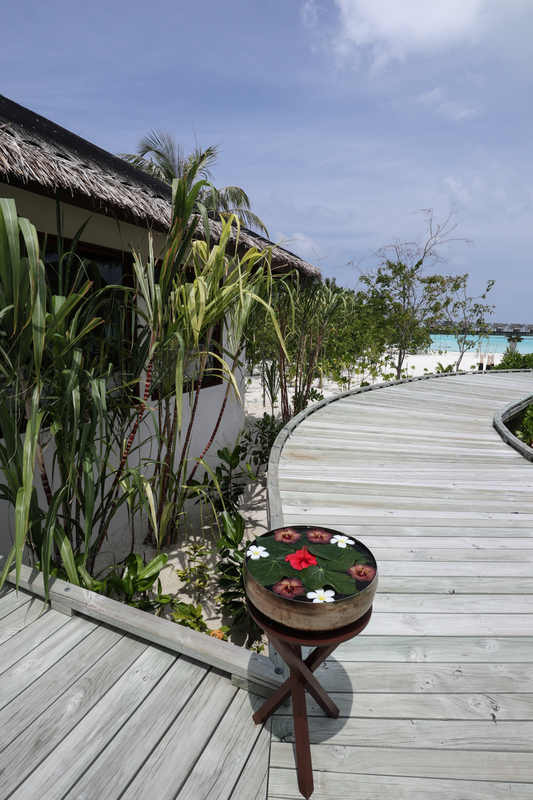 We moved to the beach villa after the first few nights and whilst I have and will always enjoy the novelty of staying above the ocean in the Maldives there is also something so uniquely special about staying just footsteps from the soft white sand of the island’s fringe. To have the option to do both was just incredible. 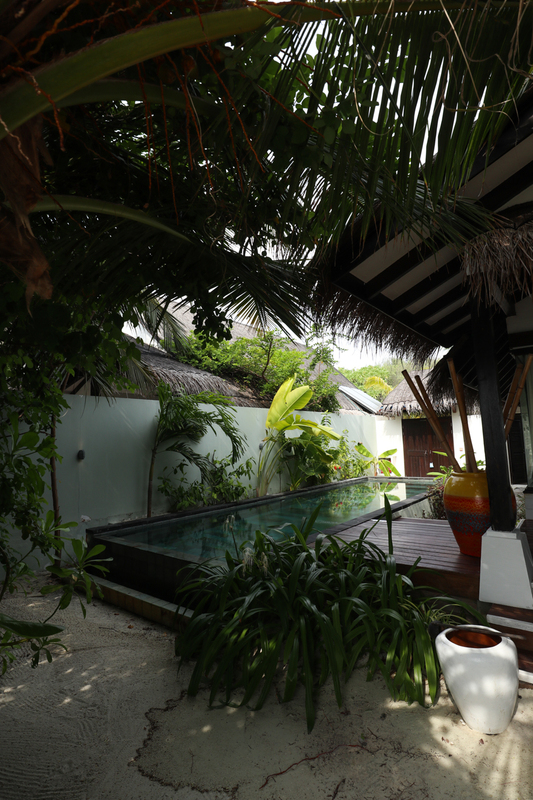 We stayed in an Earth Villa with a pool where the outdoor space was so stunning, we felt as though we had our own little resort within the resort. 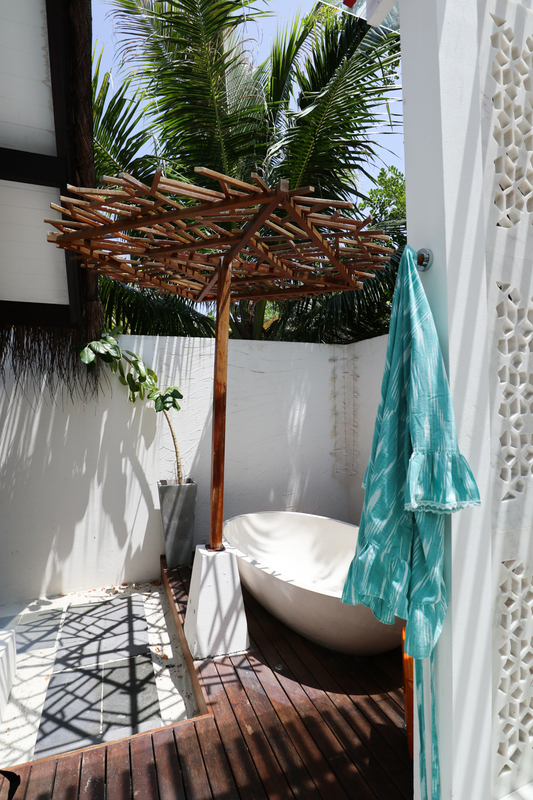 The suite featured a huge pool that was gorgeously shaped and draped with lush vegetation and palm trees, an outside bathroom, a large dressing area and then a bedroom with a four poster bed leading straight out to sea. 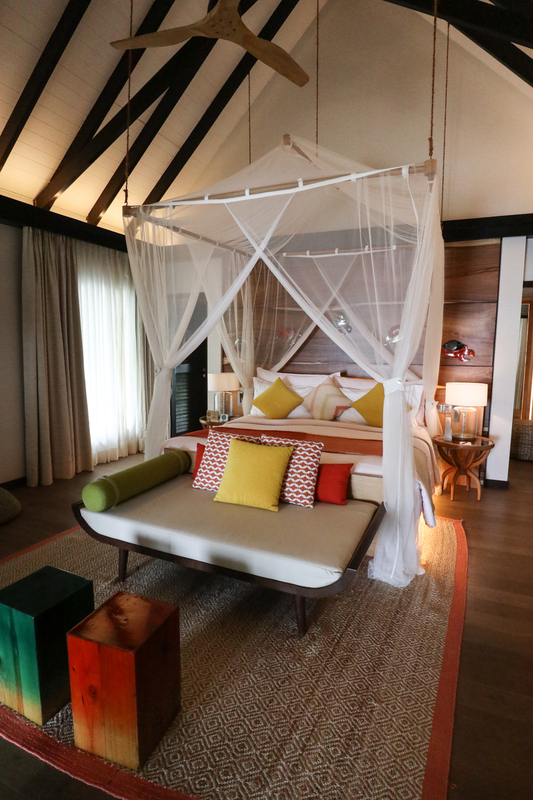 As with the water villa the five star service left us wanting for nothing than what was already provided inside the room. Including daily snacks and drinks that we could help ourselves to. 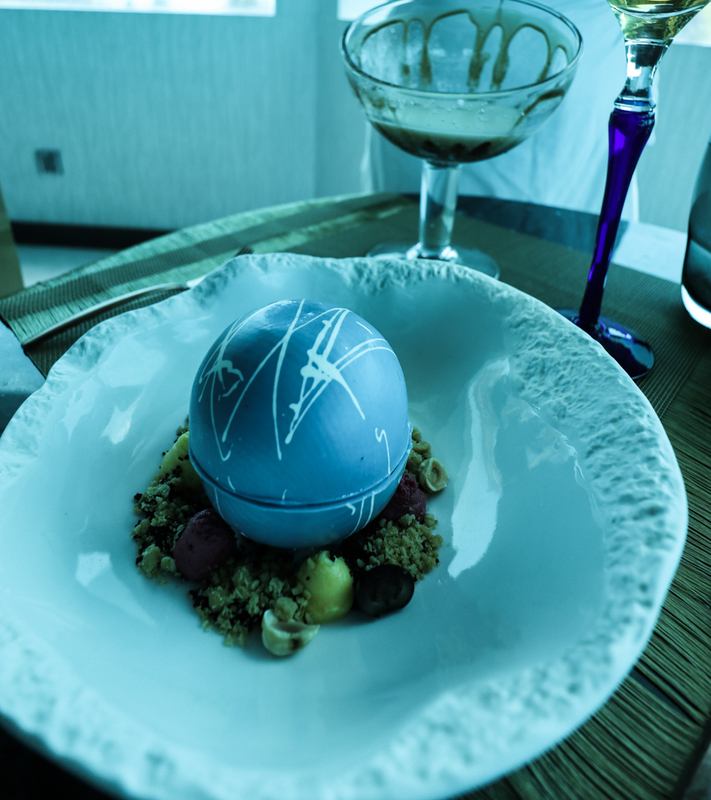 We spent our days at Ozen on the indulgence package and that covered all of our meals and drinks during our stay and what was so lovely was the twice-daily re-stock of the mini bar in the room. Every day we could tuck into the room ‘extras’ which consisted of two bottles of red wine. two bottles of white wine, two bottles of champagne, beer, soft drinks, crisps, nuts and even cold chocolate bars! This was on top pf the standard included coffee and water. It was such a nice treat to have a selection at all time so you didn’t have to worry about leaving the room at any point or incurring any scary over-priced mini bar costs (we have all been there in other resorts!). Speaking of food and drinks we, rightly so, left the Maldives a good few lbs heavier than we arrived! The dining options at Ozen were fantastic. There was a large breakfast spread that left no room for imagination and if the several stations of pre-prepared food wasn’t enough you had the option to order to the table as well. Within the first day the waiting staff were fully aware of any dietary requirements and preferences and by the time we sat down on the second morning our coffees were delivered to us within minutes, just the way we liked them! Lunch was served buffet style with the option to order additional mains at leisure and in the main restaurant the same set up followed into the evening. There was then also three additional a-la-carte style restaurants at the hotel, all of which Aimee and I sampled and glutinously worked our way through the delicious menus. 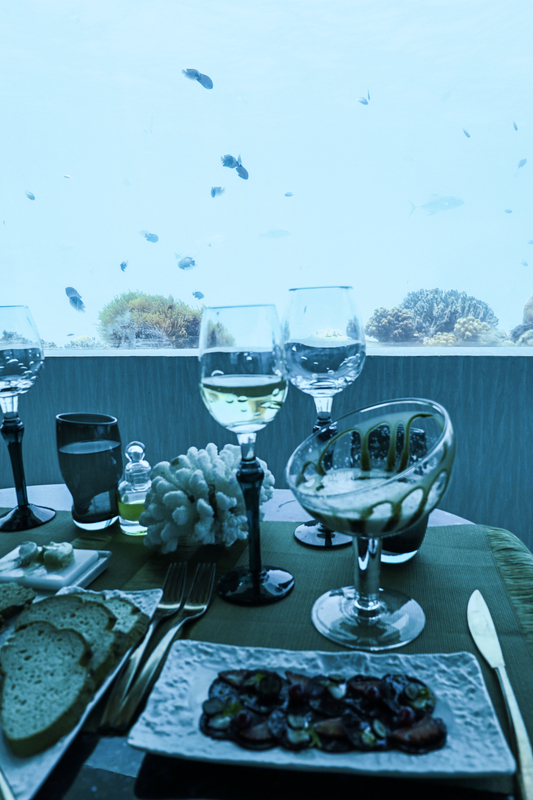 Having the ability to mix it up when dining is a real luxury in the Maldives (as I am sure you can geographically understand!) 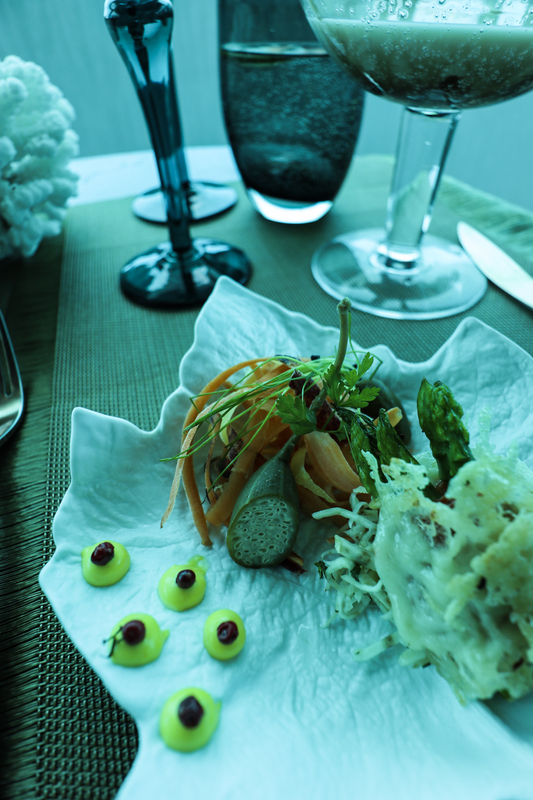 so being able to experience a different setting, ambiance and culinary journey each night is a real treat. 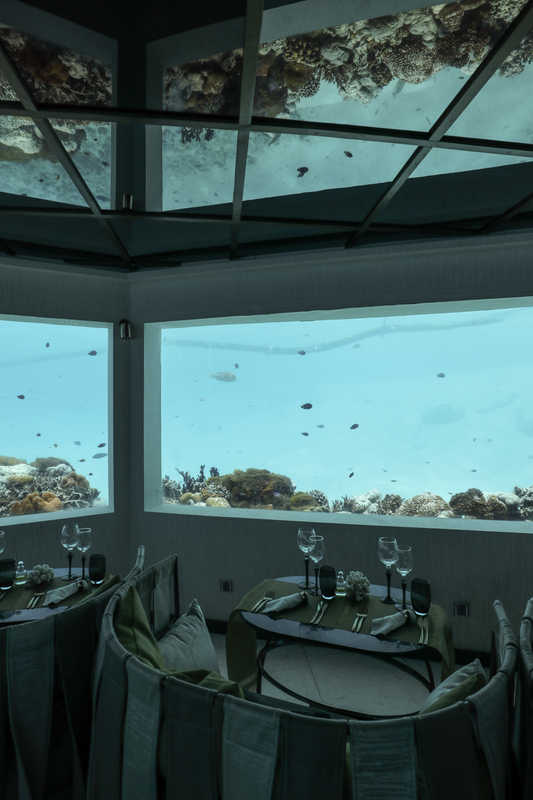 Setting itself aside from the crowds Ozen is also home to one of the world’s few Under-The-Sea restaurants. M6M serves both lunch and dinner and to this day the meal and wine pairings, combined with the once-in-a-lifetime setting made our lunch here one of the best meals I’ve ever had. 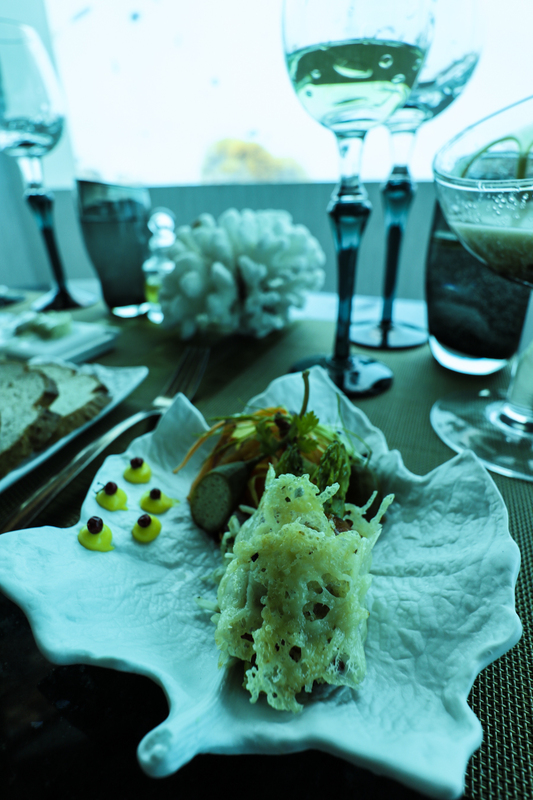 Five courses of delicious dishes, all of which aesthetically blow your mind and eagerly ignite your tastebuds! It’s one of those bucket-list style experiences but the food and wine (& amazing cocktails) does not suffer because of the gravitas of the setting, I’ll repeat myself of effect, it truly was one of the best meals I’ve ever had! 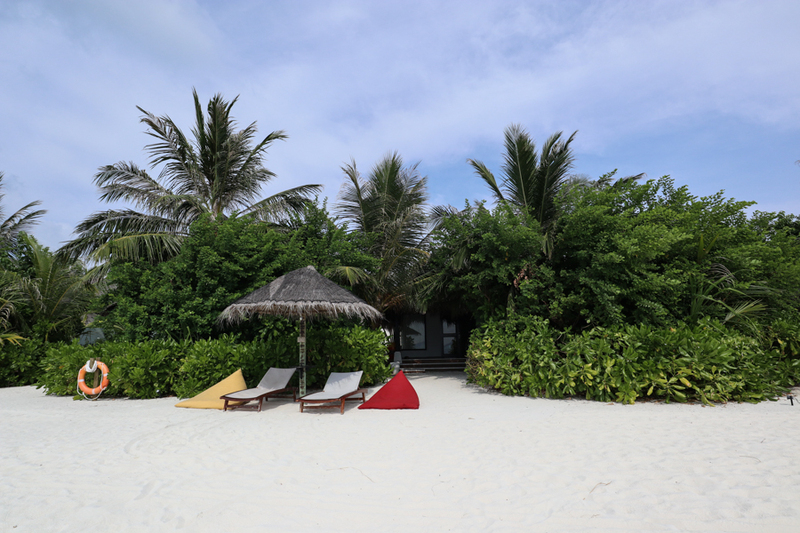 The resort is the perfect size in my opinion when it comes to Indian Ocean island resorts, small enough that you could get everywhere by foot but large enough to feel as though, at any given point, you and your partner are the only people there. 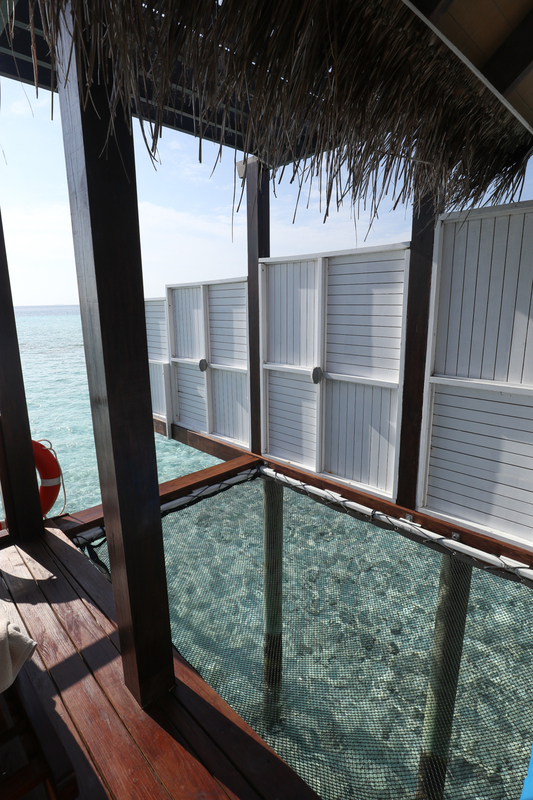 As part of the indulgence plan there is also a massage or scuba dive included in the package. 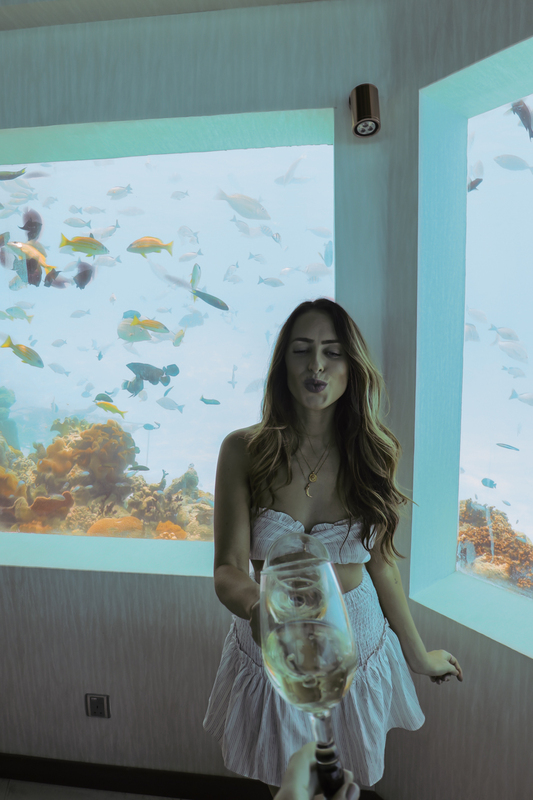 As Aimee is not a certified diver we decided that our voucher would be best cashed in at the spa 😉 Though the underwater world in The Maldives is always inviting having a decadent treatment above the ocean is an opportunity we didn’t want to miss! 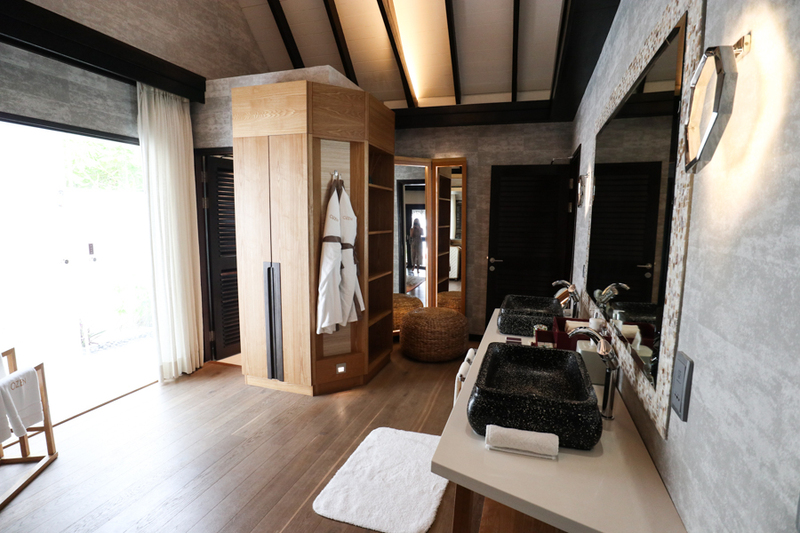 The rooms are also built above the ocean and tucked into one of the dreamiest corners of the whole resort, our massages were amazing and the entire spa area was one we didn’t leave in a hurry. 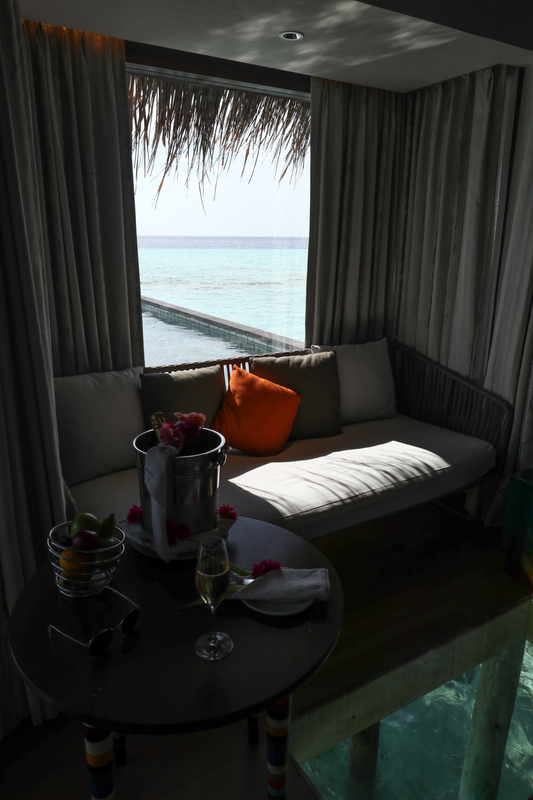 The staff gave us the warmest welcome and made our whole experience even more special with a personalised display of petals on our beds, I worry, in true honesty, for the men who have to top this when it comes to our future honeymoons! 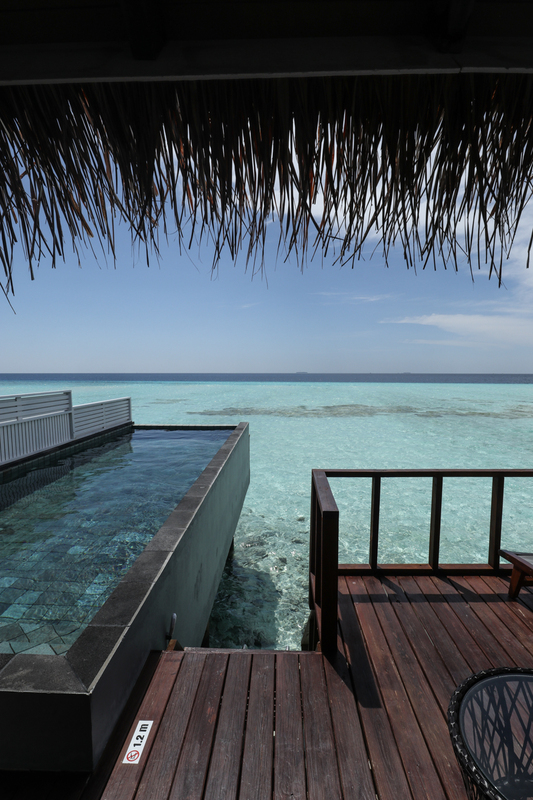 The resort does it’s very best to convince you never to leave but in my opinion what will always be the best thing about the Maldives is it’s dreamy ocean-based location. 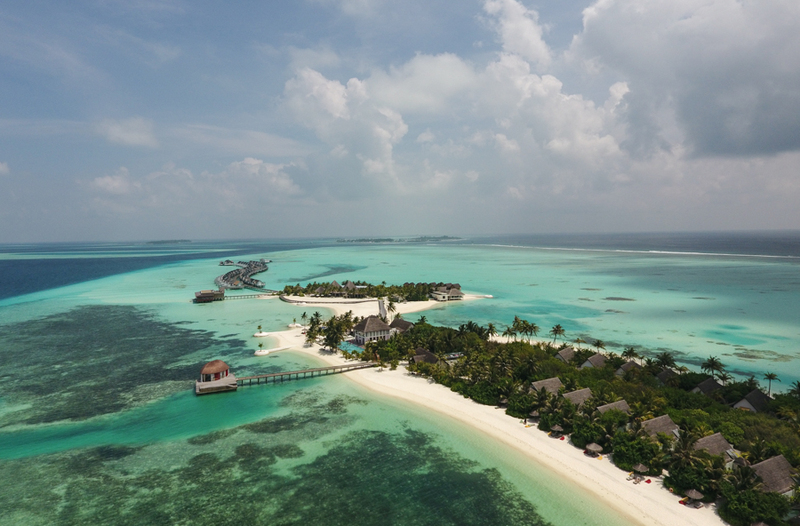 There is nothing more appealing than the world that lies beneath the glistening surface and whilst the house reef offers some great opportunities to explore, heading out to further afield by boat is an absolute must when staying in the Maldives. 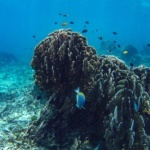 Ozen offers two complimentary snorkeling trips a day and a long list of other excursions and activities for guests to enjoy during their stay. It’s always amazing to get out to sea but a trip that Aimee and I will never forget seeing wild dolphins. The boat takes you out to an area the friendly mammals are known to frequent and you simply jump out and in to play with them all. 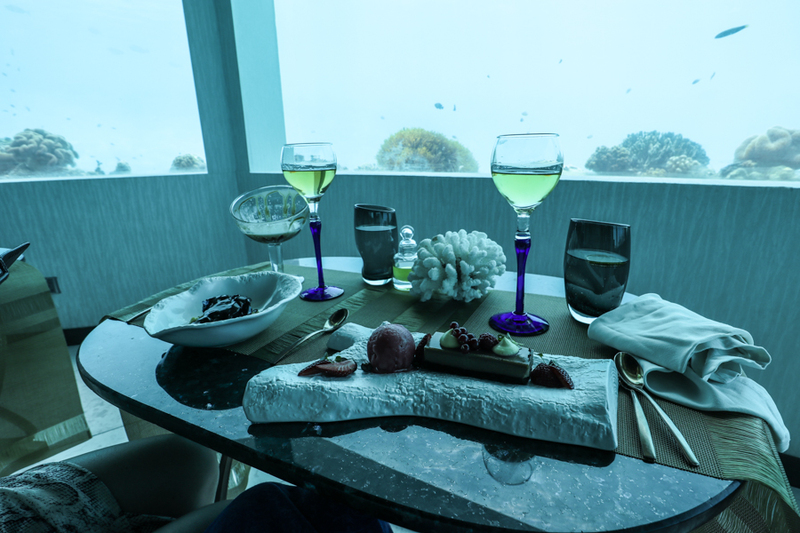 Aimee and I are both huge marine life lovers so adding in to our stay this truly once-in-a-lifetime experience was the cherry on top of an already ‘baked to perfection’ cake! There are, I’m certain of it, many more words to describe the wonder of our week at Ozen, it really was a wanderlust worthy escape that we are both incredibly grateful to have experienced but I hope that the vlog I created whilst there will give you a closer connection and insight to our week in Paradise. 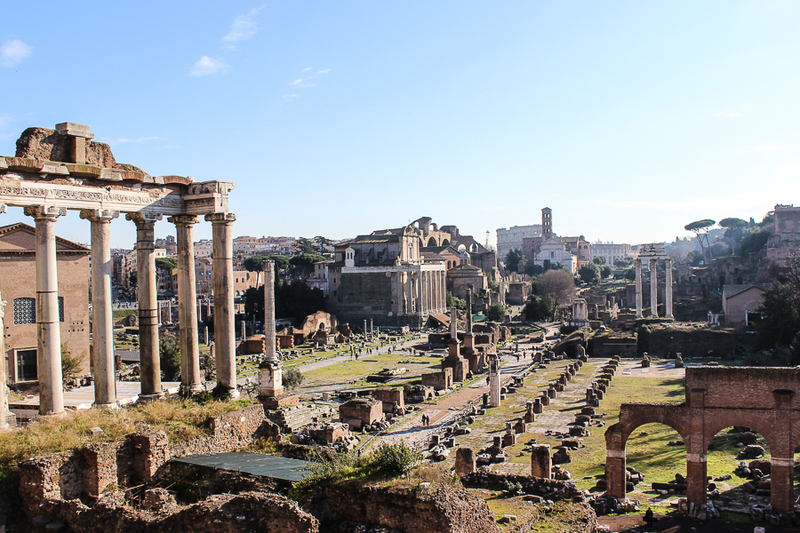 I hope to be back again soon! 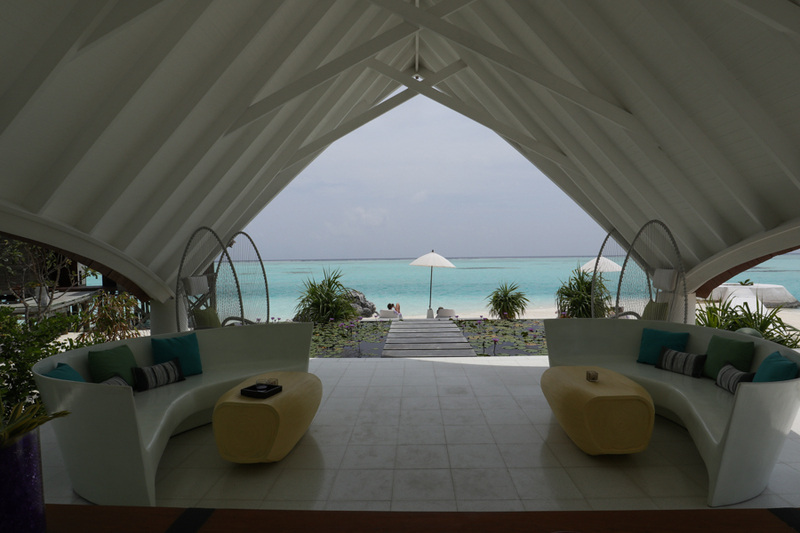 This was a collaborative stay with OZEN By Atmosphere at Maadhoo Island. 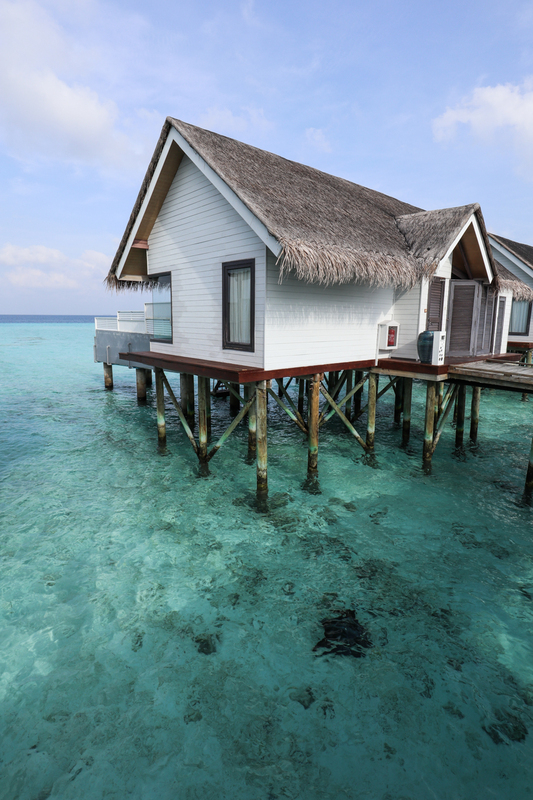 The accommodation and Indulgence Package was provide to us free of charge as part of the content creation project. What a gorgeous hotel!! Looks like the perfect place to stay.